Hi friends! Who wants chocolate for breakfast? Because I have just what you need! And so I know it’s not fall, but A) pumpkin is a year round thing for me and B) I came up with this recipe after having just a bit of leftover canned pumpkin from those Healthy Pumpkin Chocolate Chip Muffins. And if you followed me on Instagram, then you’d know that I literally can’t. stop. eating. them. YUM! But what to do with that random small amount of pumpkin left? 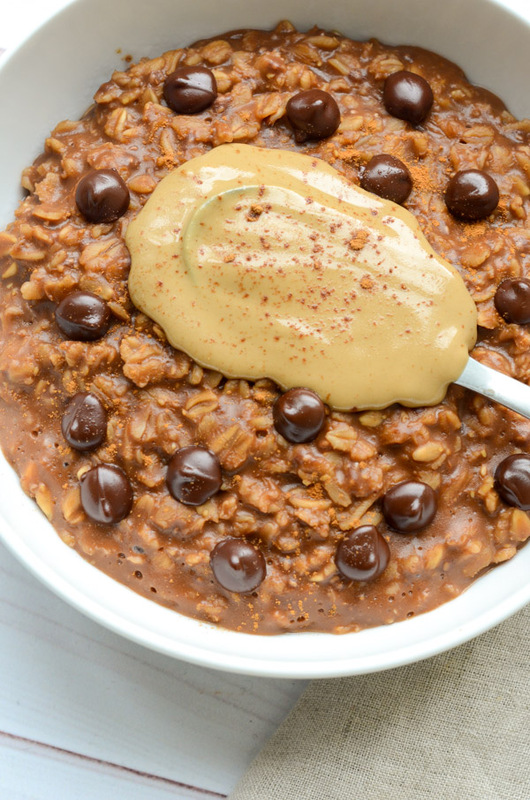 Well, this: try this Healthy Chocolate Pumpkin Oatmeal Recipe with Sunbutter. First of all I love to keep my oatmeal recipes nice and clean. 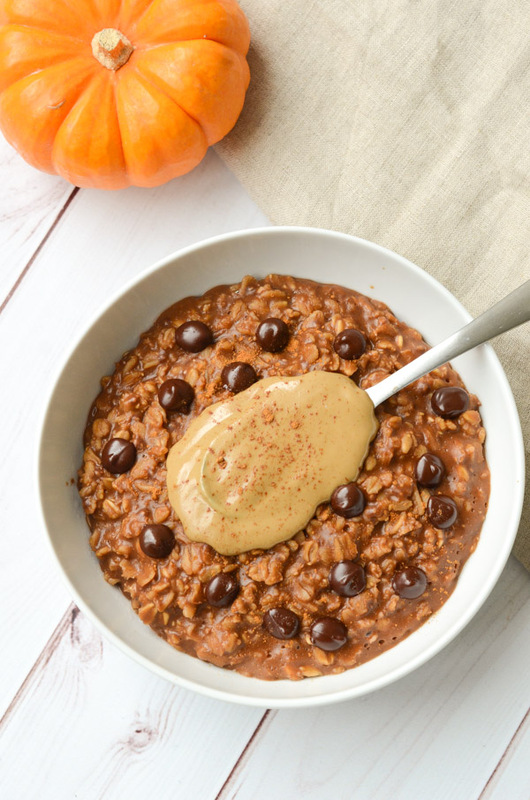 And this Healthy Chocolate Pumpkin Oatmeal Recipe with Sunbutter is no exception. And the pumpkin means you know what. Sneaking vegetables into your breakfast! Not the easiest challenge to beat, especially first thing in the day. Sunbutter is made with sunflower seeds. And the version I got at Whole Foods only adds sugar and salt to the mix. So not a one ingredient product, but I do think the additions add nice flavor without going overboard. Also, this recipe is naturally vegan! 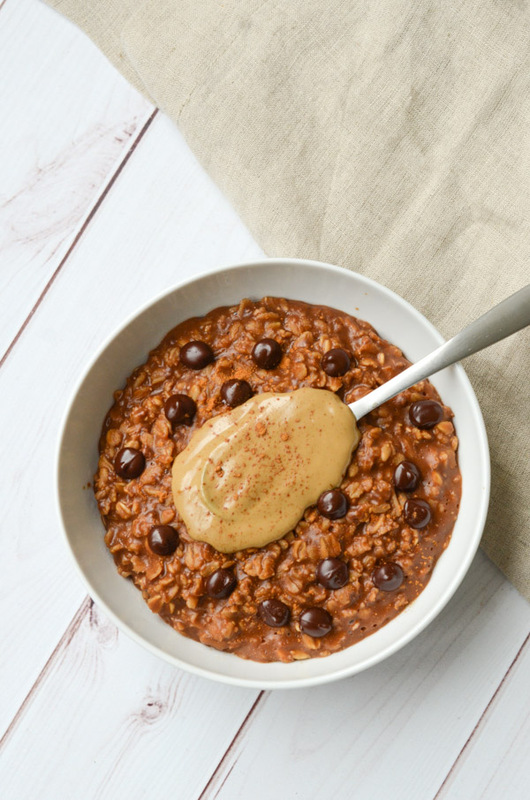 And you can make this delicious oatmeal recipe with just a few ingredients then you may already have in your pantry. Isn’t it great to enjoy recipes that don’t require lots of special shopping trips? Also I know Sunbutter isn’t the most popular nut butters. And I guess this one is really a seed-butter. Haha. But it’s really tasty. And you get the nutritional benefits of sunflower seeds! And chocolate for breakfast? CHOCOLATE! Also, I don’t think chocolate is unhealthy. Just all the extra (and usually pretty processed) sugar that comes with it. So in this recipe you get to control not only the amount of the sugar, but the quality too. Because of this, we’ll be suing less processed maple syrup instead of table sugar for this recipe. It’s delicious and will get you eating closer to the source. 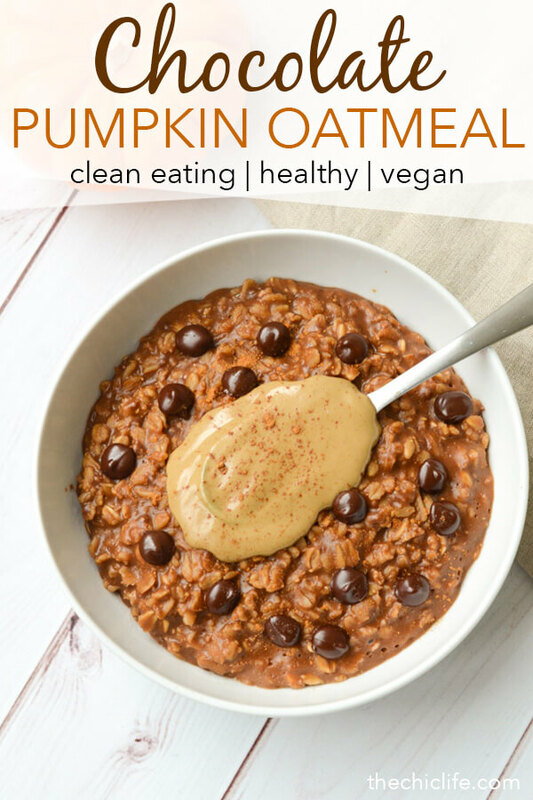 As a result, this is a healthy chocolate breakfast that happens to be clean eating, healthy chocolate pumpkin oatmeal! Who wants a healthy chocolate breakfast?! 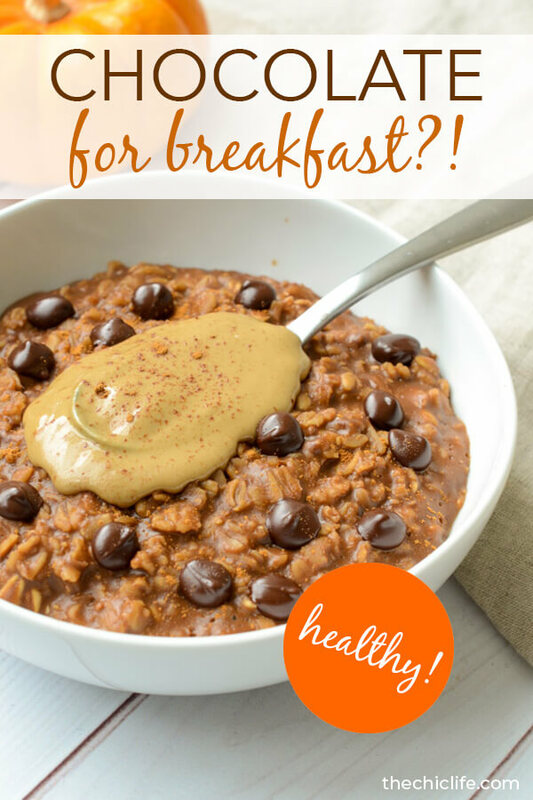 This Healthy Chocolate Pumpkin Oatmeal Recipe with Sunbutter is a simple clean eating recipe made with pantry ingredients, like leftover canned pumpkin, so you can sneak some veggies into breakfast! In a small pot, stir together oats, milk, water, canned pumpkin, cocoa powder, maple syrup, chia seeds, cinnamon, and salt. Cook over low heat, stirring occasionally, careful to not let the mixture boil. Continue cooking until the liquid is absorbed to your texture preference, about 5-8 minutes. Pour oatmeal into a bowl. Add a spoonful of sunbutter on top. Sprinkle with cinnamon (if you’d like), and enjoy! The sunbutter is optional, but I like to add it for extra flavor and to make it a little more filling. Tailor the ingredients to your taste. 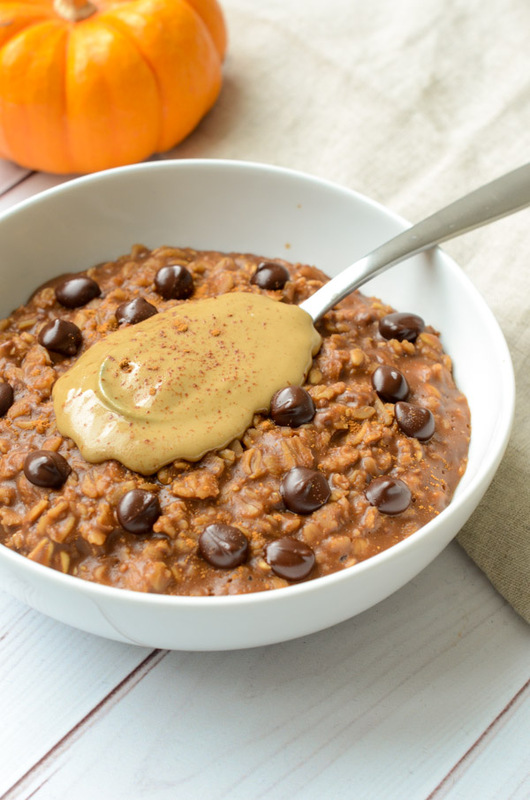 Hope you enjoy this Healthy Chocolate Pumpkin Oatmeal Recipe with Sunbutter. Thanks for stopping by! It would be an honor for you to share this with your friends! This is definitely becoming breakfast for dinner. pumpkin, chocolate and oatmeal are three of my favorite foods.